Posted on September 19, 2018 by Kelly M.
The rain from hurricane Florence reached us (and sank us!) this morning while we were harvesting for Saturday’s Moon Over Drumlin—our annual farm-to-table fundraiser gala where various local chefs prepare delectable plates using our produce, eggs, and meat. If you’re planning to attend the event, get ready to be wowed by the flavors and the spectacle! The Crops team is especially excited that volunteer Anne Patterson will be receiving the Jonathan Leavy Award in recognition of her outstanding volunteer work in the fields and in the greenhouse over the years. It’s difficult to measure or put into words all that Anne has given to Drumlin—she’s part of the team, and she stands alone doing her own thing year-round, in all weather, bringing others here, teaching and delighting them with stories and brain-melting explanations of “simple” mathematical concepts. Over time, Anne has taught me to introduce her to others not as a “retired mathematician,” but as the voluntary farmer she most certainly is. Thank you, Anne. Even though we’re continuing to pick tomatoes and beans, this past week we finally began the fall harvest thanks to three volunteer groups. On Tuesday, volunteers from the publisher Elsevier (who, Anne informed them, published her mother’s book on math!) harvested ornamental gourds. We sold some of those gourds this past Saturday here at the farm during the Fall Harvest Celebration and also at market. Gourds for sale at the market. Thanks Elsevier, and thanks to volunteers Susan Vecchi and Meg Ashforth, who staffed the Pick-Your-Own tent during the harvest celebration and helped visitors pick cherry tomatoes and flowers. This past Thursday morning, focused freshmen from Lexington Christian Academy weeded celeriac and rhubarb before crating up tons of winter squash. A special thanks to the Lexington chaperones, who, for the second year in a row, worked hard and helped us load all those heavy crates onto the trucks. 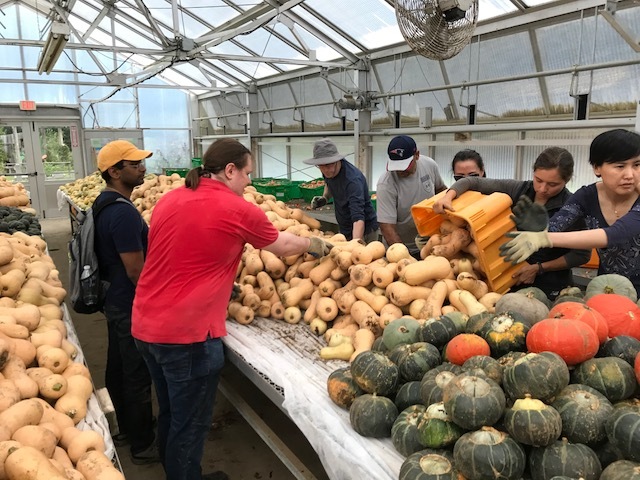 On Thursday afternoon, half the coders from NetApp harvested string beans for market, while the other half clipped and crated butternut squash. All but two of the NetApp volunteers had volunteered with us the previous year. They were so happy to be back that they stayed late to unload the squash into the greenhouse. Thanks to all those who helped with the fall harvest this past week! We have more winter squash to harvest before we begin work on the pumpkin patch, and then sweet potatoes are next on our list. Lots to do before the first frost! 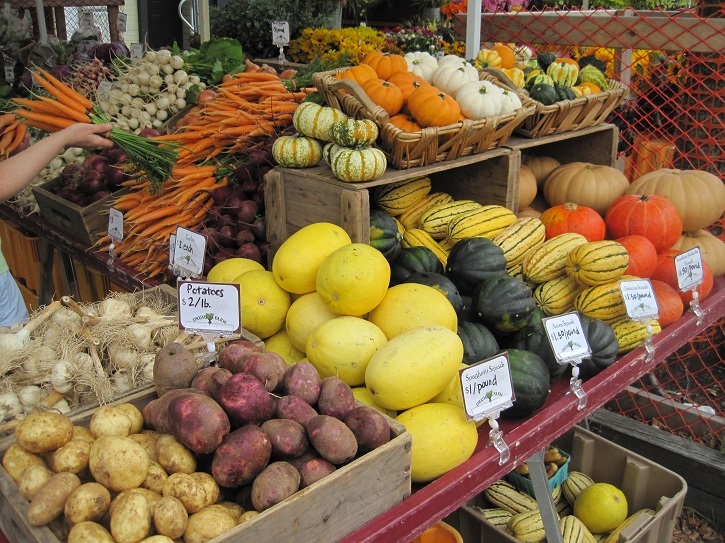 To register for our Fall CSA, please contact our CSA Coordintor at vgassert@massaudubon.org or 781-259-2200. This entry was posted in Farming and tagged crops, crops update, csa, farming, local food, sustainable, week 19 on September 19, 2018 by Kelly M..